Hillsboro Beaver Removal was one our first services we started providing to the public and we have become the go to guys around for these problems. It takes a lot of experience and knowledge to properly solve a beaver problem. When beaver get older they move out from there family and will swim up or down the water way to setup there own area. This will cause beaver to move into town or into areas that they have not been before. The best thing to do is to remove the problem before they back up the water and start cutting down tree's. The main reason we get calls from people is that the backed up water is flooding there land or that trees are falling on or in the direction of there property. The best thing to do is get the beaver out of the area before the trees have fallen. We recommend inspecting your property to notice beaver damage on your property before the water is backed up or a tree has fallen. 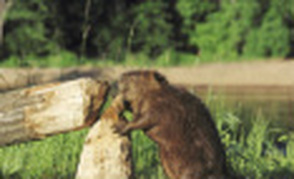 For Hillsboro Beaver Removal Call 503-201-2432 Today!